Sunset Playhouse opens the ninth season of its popular SideNotes Cabaret Series with a salute to famous cinematic melodies in SONGS OF THE SILVER SCREEN, October 6-9, 2016. Filled with unforgettable music, these glittering tunes and sparkling lyrics prove that they are movie stars in their own right. The cabaret combines the impressive talents of three of the area’s favorite performers: ALISON MARY FORBES, CHRIS KRASOVICH, and DON LOBACZ. Musical direction, accompaniment, and additional vocals will be provided by GREG SMRZ. The cabaret is written and directed by BECKY SPICE. Alison Mary Forbes is familiar to local audiences, having appeared with Skylight Music Theatre, Optimist Theatre, and Milwaukee Shakespeare. Chris Krasovich has performed with In Tandem, Skylight Music Theatre, and M&W Productions. Don Lobacz is recognized as one of the members of Four Guyz In Dinner Jackets and as lead singer with BtW classic rock band. Making his debut with Sunset Playhouse, Greg Smrz works as a cantor for St. Sebastian’s and is a member of the Milwaukee Symphony Chorus. Becky Spice is acclaimed by audiences throughout the state as an exceptional entertainer, and now adds writing and directing to her credits. 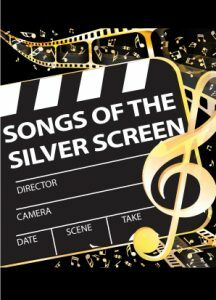 These talented performers will present songs that made their first appearances in the movies and are now standards that have lasted for decades — Singin’ in the Rain, Moon River, Over the Rainbow, As Time Goes By, The Way We Were, When You Wish Upon A Star, and many others. The show also features excerpts from the great cinematic scores of John Williams and Henry Mancini. From THE JAZZ SINGER to GHOSTBUSTERS, this cabaret celebrates nearly 100 years of musical movie magic. Performances are Thursday, October 6 at 8:00 p.m., Friday, October 7 at 8:00 p.m., Saturday, October 8 at 8:00 p.m., and Sunday, October 9 at 3:00 p.m.
Sunset Playhouse is proud to be celebrating its 57th season, and now offers eight productions in the Furlan Auditorium, six Musical MainStage concerts, three shows in the bug in a rug Children’s Theater series, and many special events. To reserve tickets, call 262-782-4430 or visit www.sunsetplayhouse.com. For group sales, contact Stephanie at 262-782-4431, ex. 291.